Who is Wise Owl Chalk Synthesis Paint? Wise Owl Chalk Synthesis Paint was born from a need to bring things back to life. It is ironic that the same concept was the inspiration for the name itself. 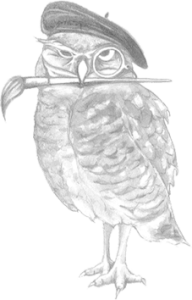 The reason Wise Owl was chosen as our brand name was because as a child, I cared for injured and orphaned owls with my mom. She was a wildlife rehabilitator specializing in birds of prey. Nurturing the sick and wounded is what my mother does best. From a very young age, I was part of this process. We cared for hawks, eagles, owls, song birds, raccoons, opossums, ground hogs, squirrels, and more. Round the clock feedings for the babies or attending to injuries was part of my childhood. One thing was certain – if an animal needed care my mom would never turn them away. Following in my mother’s footsteps, I continue to rescue wild animals to this day. Great horned owls were the most majestic and resourceful of all of the animals. I was always drawn to their quiet strength and my love for them has lasted throughout the years. When it came time to choose a name and logo for my company I remembered how the Wise Great Horned Owl had inspired me and I hoped that my paint would inspire others. I hoped that it could be a tool to bring things back from injury, from the trash, or simply to bring it back to being a cherished piece of furniture once again. My Mom and I (age 10) with Woolly Bully. Our mission is to provide premium products free of harsh chemicals and solvents. Our versatile paint is zero VOC which means there are no volatile organic compounds. Our wax is made from local beeswax and is solvent free as well. Turns out cancer causing compounds do not make better wax! Our hemp oil is 100% hemp seed oil without unnecessary fillers or preservatives. Our paint has amazing coverage and distresses with ease. Our finishes are sublime and provide strong protection for your hard work. We would like our consumers to feel good about painting and be able to do so without compromising health or the environment to do so. So create, repurpose, and bring things back to life using our products. I hope the Wise Majestic Owl inspires you as it has inspired me. The hardest part is choosing a color!